“Between A.D. 900 and 1500 most Native Americans living in Texas had developed the distinct culture that Europeans and Americans encountered and would write about.” Their cuisine included various preparations of the fish they caught in the San Antonio, Guadalupe, Pecos, Rio Grande/Bravo and other rivers. At that time the Rio Grande was not a border but, along with other rivers, an oases of food and irrigation. The Rio Grande, also called Rio Bravo, begins in Colorado and wends all the way down to Matamoros and the gulf. Along the way it meets the Rio Conchos and the Pecos. More to the East, along the coast,(Beaumont, Galveston, Houston, Victoria, Corpus Christi) our Texas Indian ancestors dined on fish that included black drum, redfish, speckled sea trout, croaker, sea catfish, flounder, sheepshead, silver perch and mullet.”(1). Smoking, grilling, steaming, drying, salting are all traditional techniques for preparing fish which of course was regularly served with corn. This fried fish method is straightforward and reflects the penchant for coupling the flavors of fish with corn, that elemental grain that was everywhere, even in our creation myths, all the way down to what is today Southern Mexico. But frying is a recent phenomenon. Deep frying foods does not get a high score with healthy cooking methods, since today most of us don’t have a rural active lifestyle, but I think it’s ok once in a while. Frying is not a Native American, Texas Mexican culinary tradition. It’s a culinary technique brought here to the Americas by Europeans who since 600 BC have been frying stuff. According to one scholar, baking versus cooking with oil “in the pan” is mentioned in the bible, Leviticus 2:7. 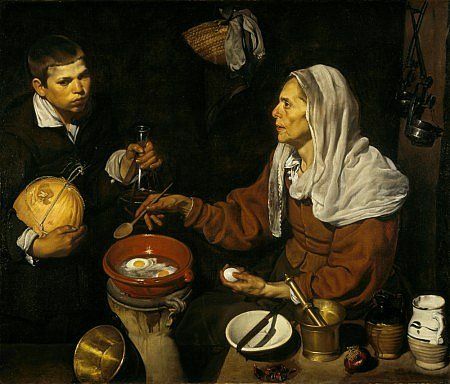 Diego Velazquez, in 1618 paints “Vieja Friendo Huevos” (Old Woman Frying Eggs), with marvelous realism, so it’s evident that frying was an everyday technique. So, we’ve adopted frying into our culinary repertoire, and what I love about it is that a fish fry is about community and celebration. Southern US “Fish Fry” is a cultural tradition that goes back hundreds of years. Also, I love the crunch in this recipe. –place in a bowl of corn meal. Make sure the corn meal covers all the surfaces of the filet. You can hold the filets in the cornmeal until you are ready to fry them. –in a deep-fryer or deep saucepan pour enough peanut oil so that the filets (2 or 3 at a time depending on the size of the pan) can be submerged. –When the oil is at 350ºF, place the filets in the oil and fry until the fish is a deep golden brown. Remove with a slotted spoon (or basket) and place in rack for holding until served. I suggest you serve it with a green vegetable, maybe snap peas, and slices of lemon. Place the melange in a bowl and add the vinaigrette. Chill for 30 to 60 minutes. Slice half a head of iceberg lettuce into 1/4″strips. Arrange in circular fashion in plates. Spoon the marinated radish mix on top and serve with the fish and sauce. 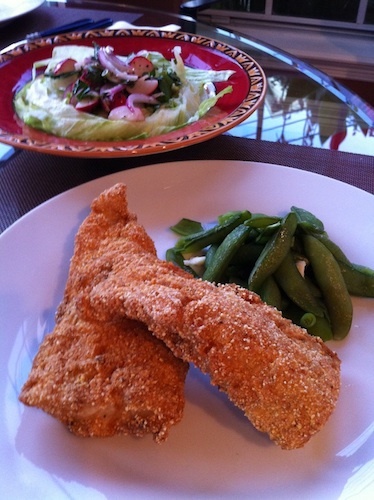 This southern Fish Fry Menu is great for Sunday dinner! 1. David La Vere, The Texas Indians, Texas A & M University Press, College Station, 2004. Hi, Ronnie, I know Robstown well, and went swimming there in Corpus Christi, Padre Island. Love it. I hope you like the remoulade with tarragon and capers. Let me know. Enjoyed your post. Was born in Robstown Tx. And grew up in Corpus Christi. I am a gringo that loves Tex-Mex and cook it at least weekly. In the fried fish recipe I am curious about the tarragon and capers in the mayo sauce. Never run across those. Thanks again, I’ll keep watching for your posts. Since you have blessed me with your blog, may I bless you with some beautiful music? This looks terrific. I’m going to try all of the dishes.